As the Pitt men’s basketball team tries to recover from a mass exodus of graduating players, transfers and dismissals, the Pitt football team will be dealing with its own loss of talent next season. Just don’t confuse the two. While the Panthers’ hoops roster for next season looks like a barren wasteland right now, the football squad should have no trouble reloading its roster for 2017 and beyond thanks to several returning stars and blue-chip recruits. There’s no denying Pitt lost a load of talent to the NFL, and some players will be virtually impossible to replace. Running back James Conner, one of the best backs in the storied history of a program filled with them, tops that list. Conner was the first Panther selected in the 2017 NFL Draft, taken by the Pittsburgh Steelers in the third round. After that, four graduating seniors — offensive linemen Dorian Johnson and Adam Bisnowaty, quarterback Nathan Peterman and defensive end Ejuan Price — got the long-awaited phone call from an NFL team on the draft’s final day. Following the draft, eight more seniors signed on as undrafted free agents with NFL teams. In total, 21 players from last year’s bunch that knocked off a pair of top five teams on its way to an eight-win season will be gone in the upcoming campaign. But that doesn’t mean the Panthers will struggle to replicate last year’s success. They might even top it — and here’s why. One thing to watch heading into the 2017-18 season is whether or not opponents learn to stop kicking the ball to Pitt junior Quadree Henderson. The 5-foot-8, 190-pound Henderson — a consensus All-American return specialist as the best kick returner in the nation — made teams pay almost every time they kicked to him last year. The speedster led the nation with four combined kick and punt return touchdowns as a sophomore. Going back to his 100-yard kick return touchdown in the 2015 Military Bowl vs. Navy, Henderson has five kick or punt return touchdowns in his last 14 games. But the return game isn’t the only area in which he can do damage. Henderson, listed as a wide receiver, caught 26 passes for 286 yards and a touchdown in 2016. He also carried the ball 60 times for 631 yards and five touchdowns, an average of more than 10 yards per carry. Most of his rushing attempts came on jet sweeps, where he started in motion before the snap and took the handoff running parallel to the line of scrimmage. These misdirection plays were a staple of the Panthers’ record-setting offense last season, and Henderson was at the center of it. Even if teams decide to kick it away from him next year, the shifty all-purpose threat will continue to be a nightmare for opposing defenses whenever he touches the ball. There was one glaring hole that stuck out all of last season which may have held the Panthers back from even greater success — the pass defense. Pitt finished next-to-last in the nation with an average of 333.2 yards allowed per game through the air. By all indications, it’s not only going to get better next season, but it could wind up being the defense’s strongest unit. It all starts with junior safety Jordan Whitehead, the 2015 ACC Rookie of the Year. Last year, Whitehead suffered an arm injury in Pitt’s 43-42 win over eventual National Champion Clemson and missed the team’s final three games. Back to full health for the upcoming season, he will have to continue to make game-changing plays in the secondary for the Panthers to succeed. Meanwhile, senior cornerback Avonte Maddox brings three years of game experience into his final season, and he appears ready to lead the defense. Standing only 5-foot-9, the jump ball has always been his weakness. But he has been a pass-breakup machine throughout the spring, and he might have been the best player on the field in April’s Blue-Gold Spring Game. Along with the two veterans are a pair of raw but uberly talented local athletes. Incoming defensive back Paris Ford is a four-star prospect and Under Armour All-American from nearby Steel Valley High School. Ford follows in the footsteps of Damar Hamlin, who signed with the Panthers out of Central Catholic High School one year earlier. A lot of buzz surrounded Hamlin going into last season, but injuries held him back and he never rose to a starting role, managing to appear in only three games. He’ll need to stay healthy to carve out a spot in next year’s secondary. With Ford, it doesn’t matter where the staff plays him — as a free safety, strong safety or cornerback — he’s good enough to make an impact right away. If he and Hamlin are able to get on the field together, the Panthers’ secondary can go from the most picked-on to one of the most-feared units in the ACC. The quarterback is clearly the most important player in today’s pass-heavy game, but the position is still open for the Panthers. Graduate transfer Max Browne and redshirt sophomore Ben DiNucci have competed for the job throughout the offseason, with the starter still remaining a mystery. But with next year’s group, the signal caller won’t have to do much to score other than turn around and hand the ball off to whoever is lined up behind him. None of the Panthers’ running backs are going to replace Conner’s production in the backfield by themselves. But with the litany of options at the coaching staff’s disposal, it’s not a stretch to envision Pitt exceeding last year’s 225.1 rushing yards per game as a team. The Panthers will miss Conner’s physical, downhill running style, but redshirt junior Qadree Ollison — the 2015 ACC Offensive Rookie of the Year — has already proven himself capable of performing well in that role. Sophomore Chawntez Moss, a shifty, agile runner who averaged 5.4 yards per carry as a true freshman, figures to be Ollison’s top competition for the starting job. While Pitt would do just fine using the two in a running-back-by-committee situation, they aren’t the only special talents vying for playing time. Incoming running backs A.J. Davis and Todd Sibley — both Under Armour All-Americans and two of the top 25 running back prospects in the country — will arrive on campus in the fall, looking to make an immediate impact. Despite having Conner last season, the coaching staff decided not to use a redshirt on Moss, and he rewarded their faith with some big-time runs. Davis and Sibley are both higher-rated prospects than Moss, so if either one appears ready for a big role in the offense, the Panthers’ coaches won’t hesitate to give it to them. Although Pitt faces one of the toughest non-conference schedules in the country after losing 13 players to the NFL, don’t expect this to be a down year for the Panthers. 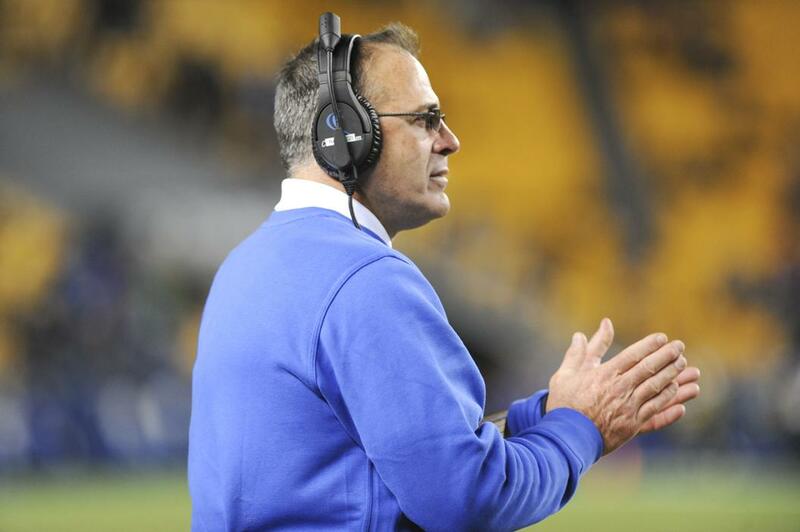 They’ve put together back-to-back 8-5 seasons in Pat Narduzzi’s first two years as head coach, and four of the losses last year were by a touchdown or less. With numerous stars returning and reinforcements coming, a nine- or even 10-win season is well within reach next year.